Editor’s Note – This is Part V of the five-part Real Estate Lead Generation Special Report a.k.a. the Local Zillow. 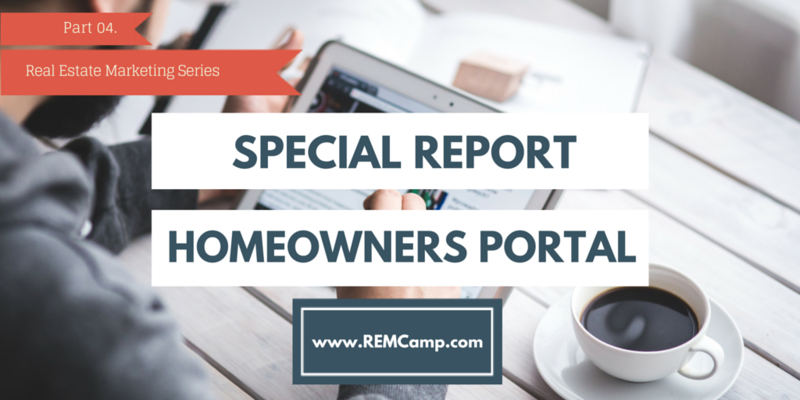 In the final piece of the real estate special report on lead generation we recommend that you add a Homeowners Portal to your real estate portal. The Homeowners Portal is a website that contains local real estate data, news and information and access is limited to local homeowners, residents and prospective buyers. The Homeowners Portal can be added as a private members’ area at the back end of your Real Estate Portal (that you set up in part IV of this special report series). Inside the members area you can add your best local content and real estate information. Your content needs to be of the highest quality and essential to every local resident. It has to be so good that local residents will agree to register as a member on your site in order to access the content. Membership should be free and open to local residents and prospective buyers. You can also segment your members into different levels so as to show unique content to the different types of members. The key is that you need to use membership software that requires registration and login to access the members’ area. The software that I use is WishList Member and OptimizePress. When local residents register you will get their contact details and permission to contact them. So why should you go to all the trouble of adding a restricted membership area to the back end of your real estate portal? The short answer is because the registration process creates a list of local residents (a pipeline of prospects) who we can contact at any time at virtually no cost. Each new member is required to give you their name and contact details as well as permission to contact them. You can then match that member to your master real estate database and rapidly fill out your database. In addition local residents get to meet and interact with you in your environment, where you are the authority, and where you can show case your local expertise. This is critical for building rapport and trust with your prospects long before they ever decide to buy or sell a home. And when they do decide to buy or sell there is a strong probability that they will come to you and ask you to represent them as their agent. It’s authority marketing at its finest! But I think there’s also a longer answer that you should explore. I truly believe that the Homeowners Portal offers a fundamentally different way for brokers to more effectively deliver their services and meet the needs of their clients. That’s because not only can you deliver great quality content that they can use to manage all their real estate needs, but you can also give them a private portal that they can use to rent, buy or sell a home. Your Homeowners Portal can become a private real estate marketplace for all things real estate – and you own it. The best way to create this private marketplace is to invite buyers and renters to register and join the portal. By getting buyers to register and join the portal, and by giving sellers access to the pool of buyers (albeit through you), you will be able to deliver the one thing that sellers really, really want – a pool of active buyers. Every agent has their own private pool of buyers, although many of the buyers are in multiple agent pools. So why not be the Zillow of your local area, the MLS for buyers, and create a place where buyers can register and join a pool that can be accessed by all homeowners – including homeowners who have not yet listed their home – and where you control the marketplace? How Will Sellers Access Your Buyer Pool? How you work with your buyer pool is entirely up to you. You may decide to do things the way you do them right now and keep your buyers pool confidential and only accessible by contracting you as their agent. You can also use your buyer pool to get sellers to register as members of your Homeowners Portal. Sellers will join the portal because they can get access to a list of local buyers. To get access to that list they will need to work through you as you control access to the list. Just image a scenario where you are the local Zillow, the custodian of every buyer and every potential seller in town. A scenario where everyone in town knows that the one go to place to meet all their real estate needs is your real estate portal. Isn’t that the holy grail of real estate marketing? Ross Hair is a real estate broker and founder of REMCamp.com – the digital marketing training leader for real estate agents.